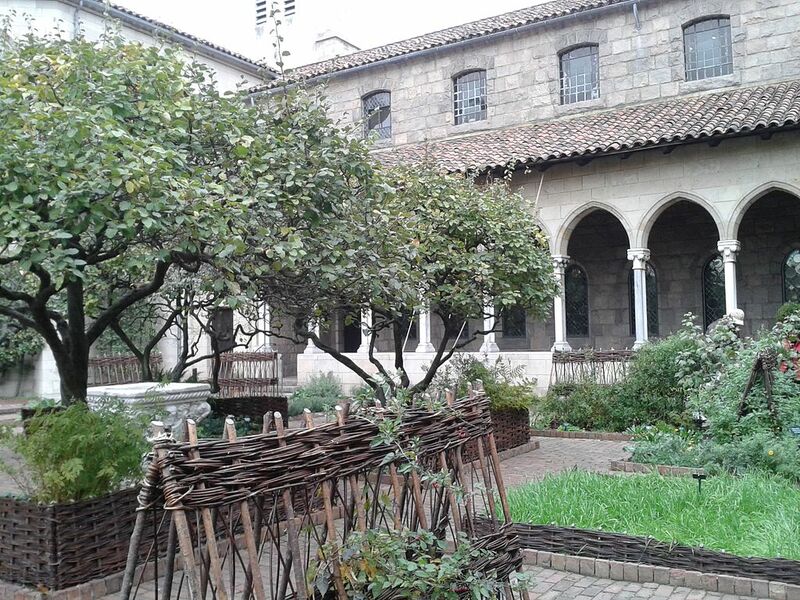 If you’ve ever longed to tour European monasteries and cathedrals, but don’t want to make the jump across the pond, perhaps make The Cloisters in northern Manhattan your next travel destination. The Cloisters, located in Fort Tyron Park, is a branch of the Metropolitan Museum of Art, dedicated to the art and architecture of Medieval Europe. The collection at The Cloisters is regarded as one of the most comprehensive displays of medieval artwork worldwide. The majority of The Cloisters exhibit was procured by the American sculptor and medieval art collector, George Grey Bernard, who studied at both the Chicago Art Institute and the prestigious, Academie des Beaux-Arts in Paris, France. Bernard began his medieval art collection while in France, collecting architectural fragments from French Villages before WW1. After earning a name for himself through his own artistic career in sculpting, Bernard returned home to America in 1896. By 1914, Bernard had amassed an extensive assemblage of European pieces and wanting to share his treasures with the world, opened a public exhibit on Fort Washington Ave in New York City. The Metropolitan Museum of Art acquired Barnard’s collection a decade after he opened his exhibit through a large grant from John D. Rockefeller. Adding to the already impressive collection of medieval artwork, Rockefeller donated some of his own pieces to the exhibit and helped facilitate the museum’s expansion. The Cloisters opened in 1938 on a lush piece of land overlooking the Hudson River. Currently, the museum maintains roughly 2000 pieces of art and is a showpiece in itself. The Cloisters museum was constructed from multiple European monasteries and features curios and artwork from the Middle Ages, providing an inclusive display of medieval arts and architecture. 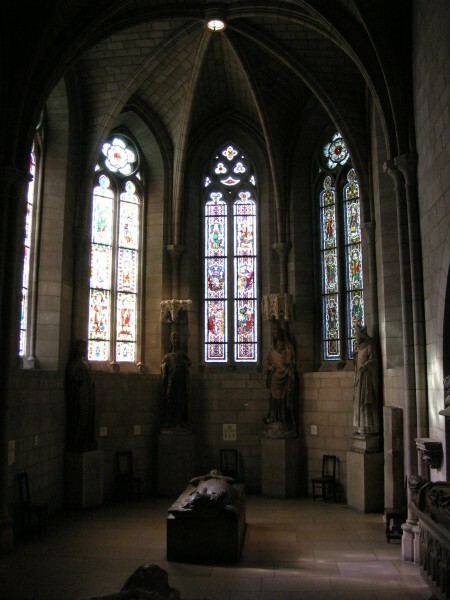 The Gothic Chapel at The Cloisters is a replica of 13th century monastic chapels. The chapel displays royal tombs from France and Spain, illuminated by tall stained-glass windows from 14th century monasteries. 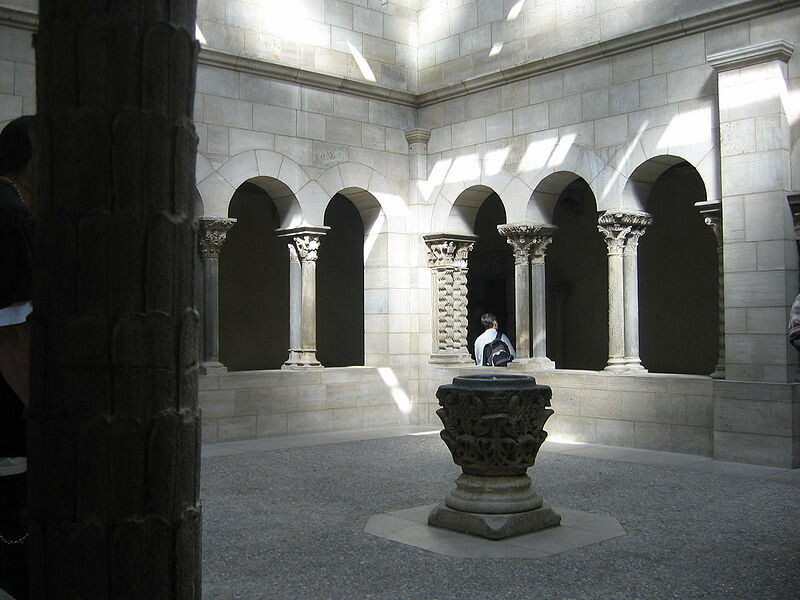 This 12th century Spanish apse is one of the main focal points at The Cloisters. A beautiful Italian entryway leads to the Fuentiduena Chapel where one can view a Catalan fresco depicting the nativity scene and a painted Spanish crucifix. The 12th century Langon Chapel features decorated capitals and multiple wood and limestone sculptures. The Early Gothic Hall overlooks the Hudson Bay from the side of the museum. The hall is lined with stained-glass windows surrounding Italian sculptures and a Sienese altarpiece. The Late Gothic Hall is a relatively new fixture within The Cloisters. Under the distinct timber ceilings of this room lay some of the museum’s most cherished items, including the “Salvation of Man” tapestry from the Burgos Cathedral. The Romanesque Hall features captivating Spanish frescoes as well as sculptures. The Treasury at The Cloisters features valuable items of both ecclesiastic and secular nature, ranging from embellished paxs to 15th century playing cards. Surrounded by silver-stained windows, the Glass Gallery contains many of the museums smaller sculptures and paintings. Walking into the Unicorn Tapestries Room, one can’t help but to be awestruck by the magnificent embroideries lining the walls. The Unicorn Tapestries are some of the best preserved pieces of the Middle Ages, depicting the hunt, capture, and resurrection of the mystical unicorn. The tapestries depict both religious and secular elements and are a great source of pride at The Cloisters. Late 14th century tapestries cover the walls of the Nine Heroes Nine depicted Christian, Hebrew, and pagan heroes inspired by an early 14th century poem. The gallery displays the 5 tapestries that survived to the present day, including the Hebrew heroes, David and Joshua, and the pagan heroes, Julius Caesar, Hector of Troy, and King Arthur. The Boppard Room features Spanish and German artwork of the late Middle Ages including stained-glass windows, an altar with head reliquaries, and aquamaniles. The aquamanile collection consist of fanciful water vessels initially used by priests to cleanse their hands before ceremonies and then later as a common precursor to dinner. The Merode Room reflects a common monastic devotional room, including an altarpiece and small works of art. The Saint-Guilhem Cloister is filled with detailed capitals and columns originating from the Benedictine Abbey of Saint-Guilhem-le-Desert, a prosperous monastery located along a pilgrimage road that ran from France to the holy shrine of Santiago de Compostela in Spain. Walking through the gardens at The Cloisters, it’s easy to forget you’re in NYC. Using medieval treatises, poetry, herbals, and tapestries as a reference, the gardens at The Cloisters take every detail into account in recreating agricultural landscapes of the Middle Ages. 14th century capitals and columns from the Bonnefont en Comminges monastery compose this cloister, with the centerpiece being the medieval herb garden. The Bonnefont herb garden maintains over 250 species of plants prolific throughout the Middle Ages. The plants are arranged in groups according to their usage, ranging from “magic plants” to aromatic and medicinal shrubberies. Constructed with stone cloister elements originally created for the abbey at Trie-sur-Baise, The Trie Cloister and Garden maintains an enchanting floral display, reflecting mille-fleur backgrounds of medieval tapestries. The Cuxa Cloister and Garden is at the heart of the museum. The Cloister is constructed with pink stones and contains fanciful capitals symbolic of medieval life. A fountain serves as a centerpiece to this garden. For a visit to the Cloisters at the Metropolitan Museum of Art in New York click here.